If a traditional French Quarter breakfast can end with a dessert, maybe it’s not so surprising that it can also begin with a cocktail. Indeed, at Brennan’s Restaurant (417 Royal St., 504-525-9711), the lavish and almost canonized breakfast menu includes an entire page of cocktail recommendations that the landmark establishment introduces as “eye openers.” Many of these drink selections are as unique to New Orleans as the intricate egg dishes and flaming desserts that follow, with names like sazerac, Ramos gin fizz and milk punch. Welcome to the rich and distinctive cocktail culture of New Orleans. The city that has a worldwide reputation for good times and hearty indulgence also has its own lore and history for the stuff that helps fuel its many celebrations – even if that celebration is nothing more than a courtyard breakfast. 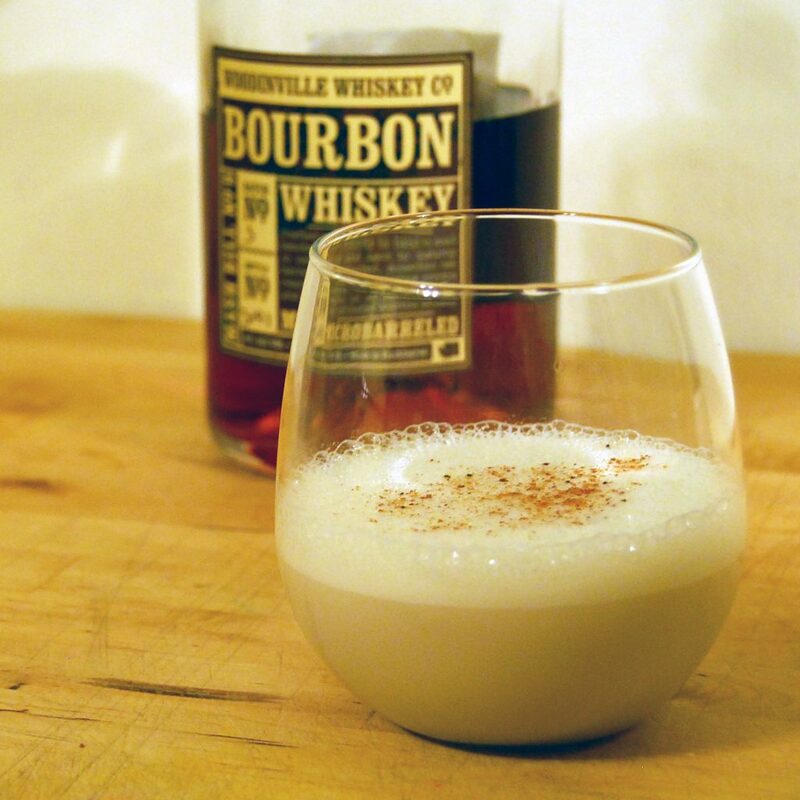 Milk punch is an instructive starting point. Made with milk, sugar, brandy and a little nutmeg, the drink is a creamy and sweet answer to the more common bloody Mary. It’s the sort of cocktail to enjoy while the sun is shining, and preferably when there are no responsibilities scheduled for the rest of the day. Many of the finer restaurants around the Quarter serve it well, and a surprising number of the smaller restaurants and cafes have a distinctive take on this morning favorite. 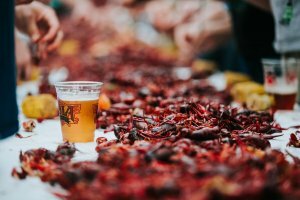 New Orleanians live with a profound respect for the naturally-occurring hurricane – small wonder in a town largely below sea level – but visitors might sooner associate the city with the fruity hurricane cocktail. 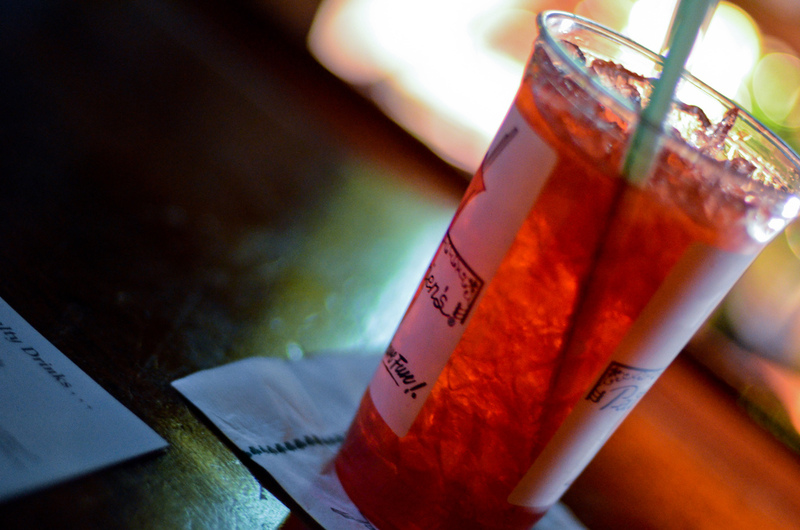 Certainly one of the most visible beverages in the French Quarter, this bright red, rum-based drink is the de facto emblem for the bar that created it, Pat O’Brien’s (718 St. Peter St., 504-525-4823), and has been widely copied around town. 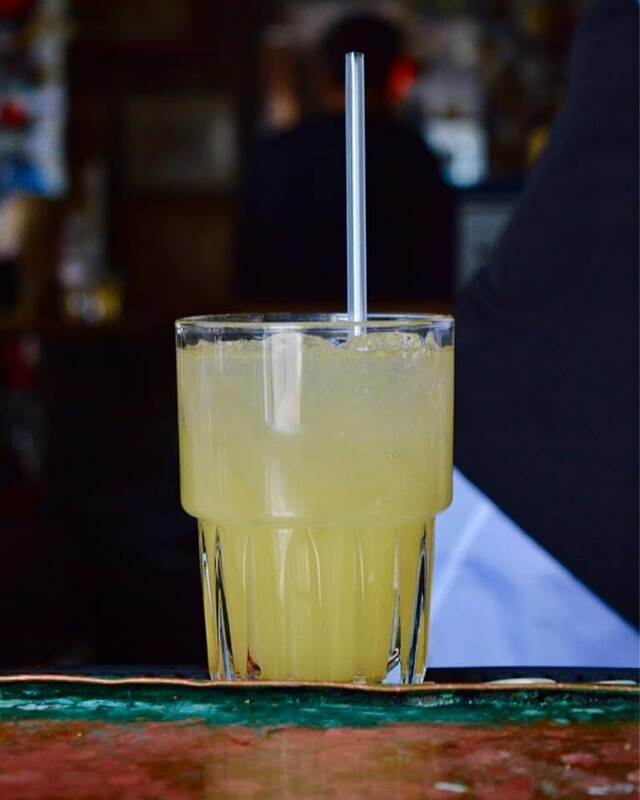 Highly potent, the drink has been known to supercharge a night on the town and brighten up even the most overcast day in the Quarter. The story of the drink’s origin holds that, due to difficulties importing Scotch during World War II, liquor salesmen forced bar owners to buy up to 50 cases of their much more abundant rum in order to secure a single case of good whiskey. The barmen at Pat O’Brien’s soon came up with an alluring recipe to clear through their bulging surplus of rum. When they decided to serve it up in a tall, jaunty glass shaped like a hurricane lamp, the hurricane cocktail was born. Today, even the glass itself is a souvenir of New Orleans, and servers at Pat O’Brien’s will helpfully box yours to go when you’re finished. 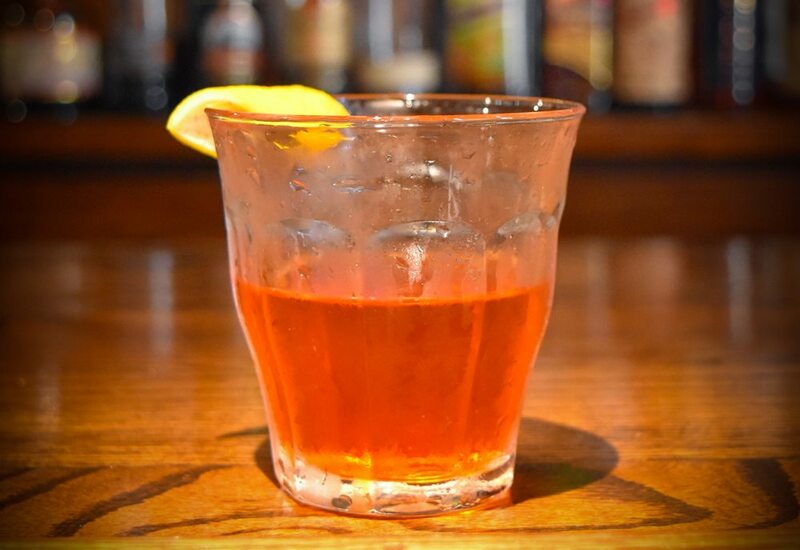 The origins of the sazerac are quite a bit murkier, with some sources proclaiming it as the very first cocktail and more than a few local bon vivants naming it as New Orleans’ quintessential cocktail. A combination of rye whiskey, bitters, sugar, lemon peel and an absinthe substitute (such as Pernod or Herbsaint), the cocktail is rich and complex, an elegant sipping drink to be sure, and is typically served in the finer Creole restaurants and classic barrooms. A cocktail this intricate deserves careful preparation and proper presentation, which happily are two of the hallmarks of the The Bombay Club (831 Conti St., 504-586-0972), located in the Prince Conti Hotel. 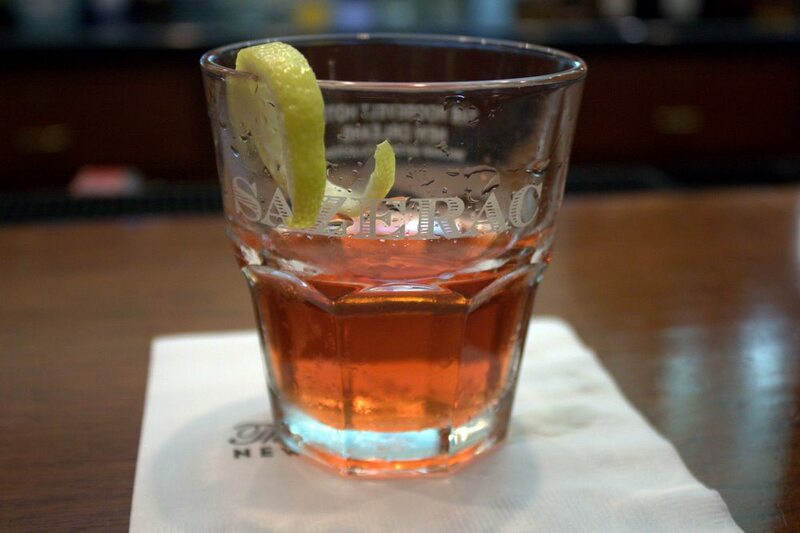 Fittingly, the Sazerac Bar (130 Roosevelt Way 504-648-1200) in The Roosevelt Hotel, just on the other side of Canal Street from the Quarter, also serves a commanding version of its namesake drink. 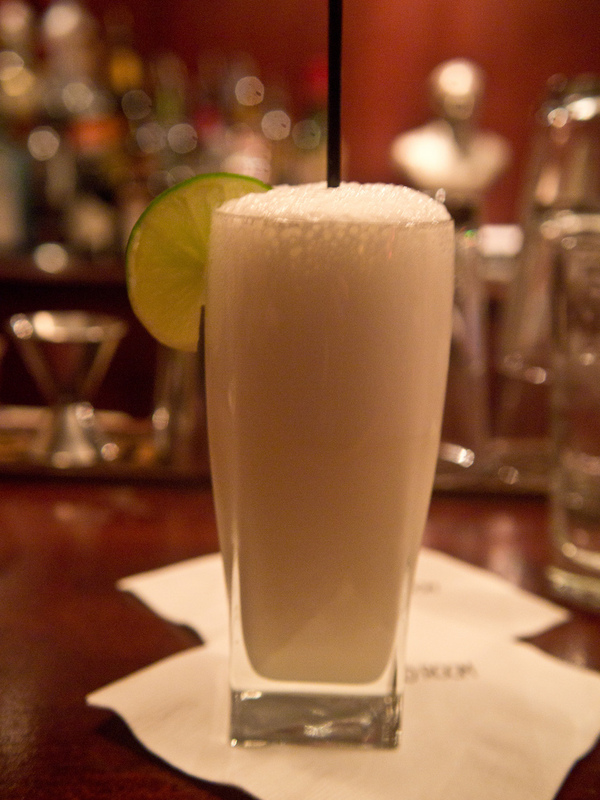 The same bar lays claim to being the birthplace of the Ramos gin fizz, named for the hotel bartender Henry Ramos who is said to have invented it in 1888. This unique concoction mixes gin, lemon and lime juices, orange flower water, egg white, powdered sugar and milk, and has a taste that has been described as “drinking a flower.” In the French Quarter proper, the Carousel Piano Bar and Lounge (214 Royal St., 504-523-3341) in the Hotel Monteleone is an appropriately elegant setting to sample one with its slowly revolving bar and plush appointments. Far, far on the other end of the spectrum is the Hand Grenade, truly a Bourbon Street original that proves not all of the city’s distinctive drinks are rooted in the past. 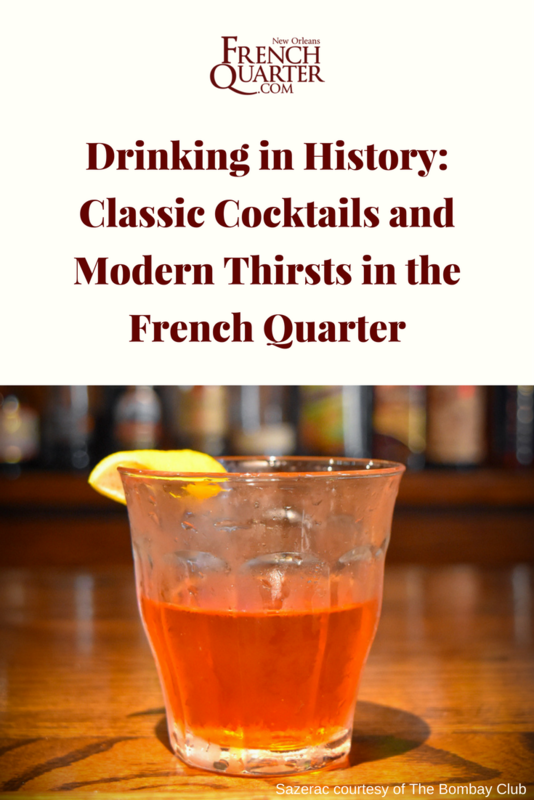 The drink is prepared and served at the two French Quarter outposts of the Tropical Isle (435 Bourbon St., 504-525-1689, 600 Bourbon St., 504-529-1702, 610 Bourbon St., 504-529-1702, and 721 Bourbon St., 504-529-4109), but, since it is often taken to go, its memorable neon-colored, hand grenade-shaped containers can be seen swinging from the happy hands of visitors all over the Vieux Carre. 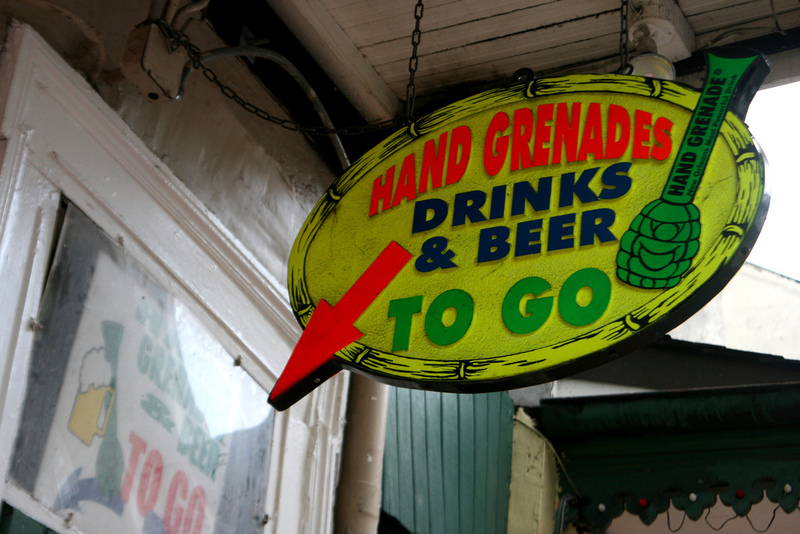 The drink even has its own mascot, a character dressed in an inflatable grenade costume, who bounces around Bourbon Street encouraging consumption. If he ever encounters a true hurricane on his travels, it will surely be an historic encounter for New Orleans mixology. Absinthe was once a drink that was considered so dangerous it was outright banned in many countries (including this one, up until 2007). How does New Orleans deal with this potentially dangerous spirit? We make it more accessible by converting it into frappe form. This mint green drink is both refreshing and a little worrying; it’s one of those cocktails that doesn’t let you know how strong it is (strength? Kicked by a donkey) until it’s a little too late. So where should you settle in for an Absinthe Frappe served right? Most locals will tell you to head to the Old Absinthe House (imagine that), a buzzing Bourbon Street bar where locals and tourists rub shoulders and chase the green fairy. Have you ever had a Brandy Crusta? Neither have we. This early incarnation of the modern sour drink featured heavy use of cognac and Grand Marnier, as well as some other goodies like simple syrup and lemon juice. 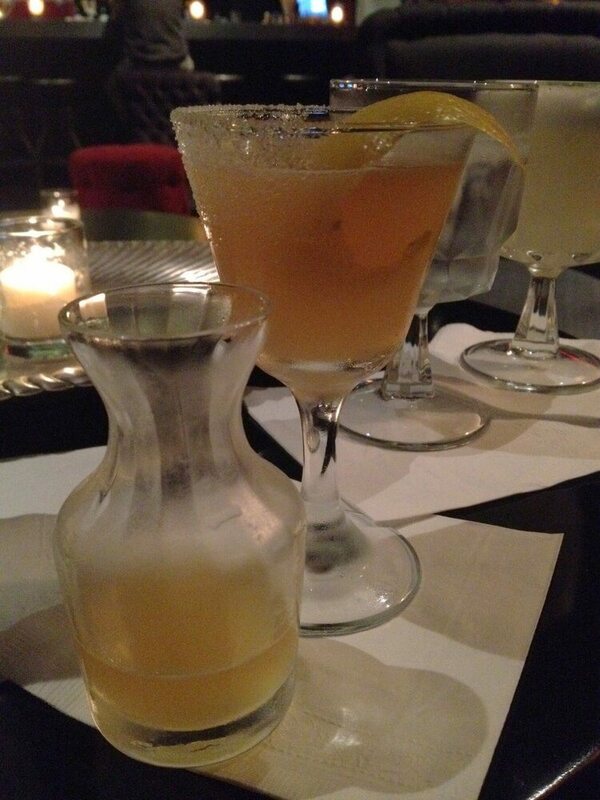 If all of the above sounds familiar, you’re likely thinking of the Sidecar, a contemporary drink that was invented right here in New Orleans in the 1850s (sadly, the hotel at the heart of that invention is no longer with us). Brandy Crustas may be tough to find, but any competent New Orleans bartender should be able to serve you up a Sidecar at a moment’s notice. While we don’t have a clear favorite spot for those drinks, the ones fixed up the Kingfish (3337 Chartres St) have always been top notch. The café brûlot is no ordinary after dinner coffee. The name, in French, means either ‘highly seasoned’ or ‘incendiary/fiery’ coffee, and both of those descriptions really get at what you’re about to drink. Drinking café brûlot is a production that requires specialized ingredients and even tools. Waiters bring, per our story on the spectacle, “orange peel – cut precisely as one long spiral; a lemon peel cut into strips; sugar, cloves and cinnamon; cognac or brandy and hot, strong black coffee”. 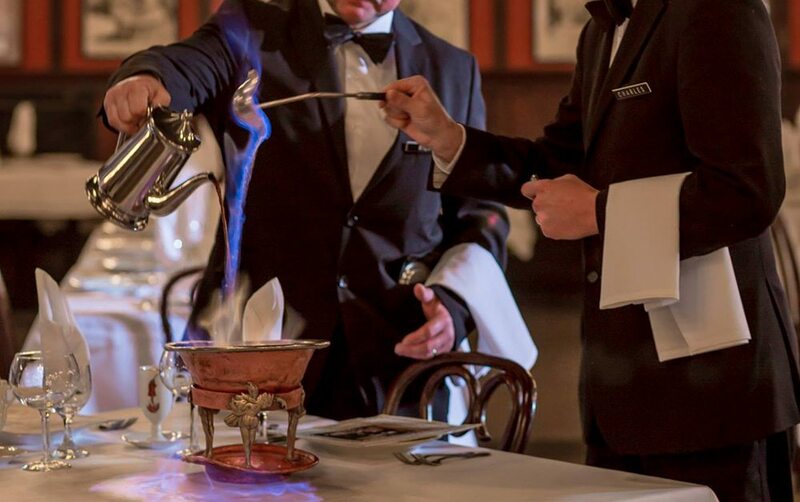 All of these ingredients are slowly ladled together and – why not – set on fire during an elaborate tableside ritual that forms one of the greatest set pieces of New Orleans gastronomic theater. Obviously, a café brûlot isn’t some drink you can just rock and order at any old bar – it’s an after dinner affair best enjoyed in old line restaurants like Antoine’s (where the drink was supposedly invented), Arnaud’s, or Galatoire’s. 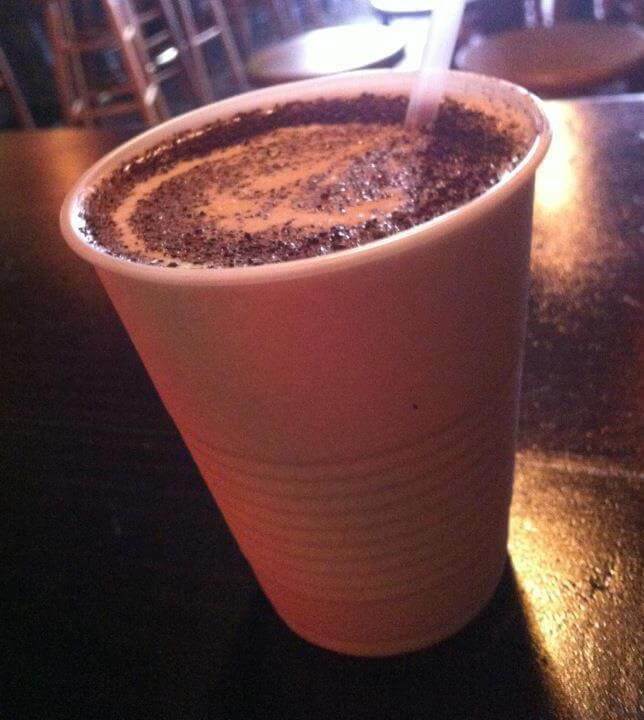 Was frozen Irish coffee invented in New Orleans? We doubt it, but this city lays claim to some of the best versions of this delicious drink, which is a sweet and sassy way of giving yourself both a caffeine and liquor boost. The drink comes out like a milkshake, and can taste dangerously un-boozy; be careful, a few of these can get to your head. Both the Erin Rose and Molly’s at the Market are known for their frozen Irish coffees, which are unsurprisingly a hit with service industry workers who need a pick me up even as they take the edge off. 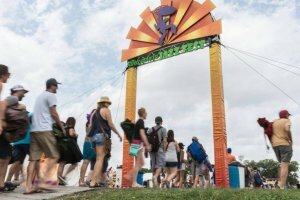 Coming to New Orleans soon? Be sure to check out our Hotels page to find a charming boutique hotel in the French Quarter.